In radiation therapy, the computer-assisted deep inspiration breath-hold (DIBH) technique is one approach to deal with respiratory motion of tumors in the lung, liver, or upper abdomen. However, inter- and intra-breath-hold deviations from an optimal static tumor position might occur. A novel method is presented to noninvasively measure the diaphragm position and thus estimate its residual deviation (as surrogate for the tumor position) based on cone-beam computed tomography (CBCT) projection data using active breathing control during acquisition. The diaphragm dome (DD) position relative to the isocenter of a linear accelerator is known from the static (DIBH) planning CT. A ball-bearing phantom (BB) is placed at this position, a CBCT dataset is acquired, and in each projection the position of the projected BB is determined automatically based on thresholding. The position of the DD is determined manually in CBCT projections of a patient. The distance between DD and BB (ideal static setting) in craniocaudal direction is calculated for a given angle based on the distance in the projection plane and the relative position of the BB referring to the source and the detector. An angle-dependent correction factor is introduced which takes this geometrical setting into account. The accuracy of the method is assessed. The method allows a CBCT projection-based estimation of the deviation between the DD and its optimal position as defined in the planning CT, i.e., the residual motion of the DD can be assessed. The error of this estimation is 2.2 mm in craniocaudal direction. The developed method allows an offline estimation of the inspiration depth (inter- and intra-breath-hold) over time. It will be useful as a reference for comparison to other methods of residual motion estimation, e.g., surface scanning. F. Stieler and A. Simeonova-Chergou authors contributed equally to this publication. In der Strahlentherapie bietet die Technik des computergestützten inspiratorischen Atemanhalts („deep-inspiratory-breath-hold“, DIBH) einen Ansatz, um mit atmungsbedingter Bewegung von Lunge, Leber oder oberem Bauchraum umzugehen. Dennoch können Abweichungen von der optimalen statischen Tumorposition vorkommen („inter-“ und „intra-breath-hold“). 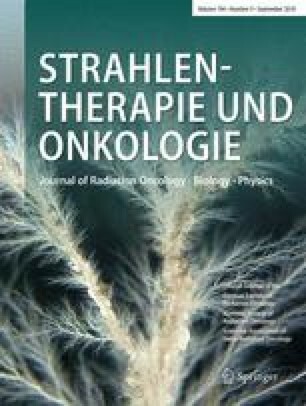 Eine neue nichtinvasive Methode wird vorgestellt, um die Zwerchfellposition und damit dessen Restbewegung (als Surrogat der Tumorposition) auf Basis von Cone-beam-Computertomographie(CBCT)-Projektionen, die unter aktiver Atemkontrolle aufgenommen wurden, zu bestimmen. Die Position der Zwerchfellkuppel („diaphragm dome“, DD) relativ zum Isozentrum eines Linearbeschleunigers ist aus dem statischen (DIBH) Planungs-CT bekannt. Ein Ball-Bearing-Phantom (BB) wird an dieser Stelle platziert, ein CBCT-Datensatz aufgenommen und in jeder Projektion die projizierte BB-Position automatisch per Schwellwert bestimmt. Die DD-Position wird manuell in den CBCT-Projektionen bestimmt. Der Abstand zwischen DD und BB (ideale statische Situation) in kraniokaudaler Richtung wird für einen gegebenen Winkel auf Basis des Abstands in der Projektionsebene und der relativen Position des BB bezüglich der Quelle und des Detektors berechnet. Ein winkelabhängiger Korrekturfaktor wird eingebracht, der dieses geometrische Setting berücksichtigt. Die Genauigkeit der Methode wird untersucht. Die Methode erlaubt eine Einschätzung der Abweichung zwischen DD und dessen optimaler Position auf Basis von CBCT-Projektionen; die DD-Restbewegung kann also abgeschätzt werden. Der Fehler dieser Schätzung liegt bei 2,2 mm in kraniokaudaler Richtung. Die entwickelte Methode ermöglicht eine Offline-Schätzung der Restbewegung unter DIBH („inter-“ und „intra-breath-hold“) und kann beim Vergleich mit anderen Methoden zur Schätzung der Bewegung (z. B. Oberflächenscan) als Referenz verwendet werden. M. Blessing reports grants from German Government outside the submitted work. J. Boda-Heggemann reports personal fees from Elekta AB during the conduct of the study. F. Lohr reports grants and personal fees from Elekta AB, grants and personal fees from IBA, personal fees from C‑RAD during the conduct of the study. F. Wenz reports grants and non-financial support from Elekta during the conduct of the study; and grants, personal fees, and non-financial support from Carl Zeiss Meditec, grants and non-financial support from Nucletron, personal fees from Celgene, personal fees from Ipsen outside the submitted work. F. Stieler reports personal fees from Elekta AB during the conduct of the study. J. Hofmann, L. Vogel, and A. Simeonova-Chergou declare that they have no competing interests.